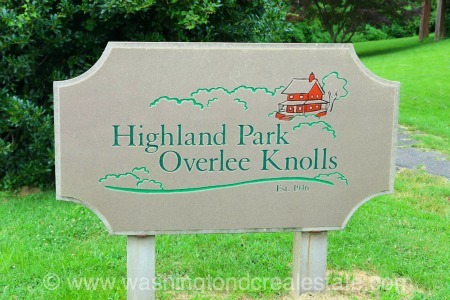 Highland Park - Overlee Knolls is a neighborhood of slightly more than 600 homes located in Arlington, VA. Comprising 34 blocks, the Highland Park - Overlee Knolls neighborhood was developed in the first half of the 20th century, drawing residents to its close proximity to Washington, DC and cool breezes due to its high elevation. Early residents of the neighborhood utilized the Fostoria Railroad Station as the community was first known. Highland Park Overlee Knolls is bounded by 22nd Street N to the north, N Lexington Street and N McKinley Road to the east, Rt 66 to the south and N Quantico Street to the west.